Welcome to Queens. It's a big place, the biggest borough in New York and growing fast. It's not the prettiest part of NYC, but this place has real New York written all over it. Want to see it? There are lots of subway lines radiating out from Midtown Manhattan into western Queens, but only one is a National Millennium Trail Hop aboard the "International Express," or #7 Flushing Local, to get a flavorful taste of this diverse borough in one afternoon. The subway's got its nickname by serving a span of interconnected neighborhoods bustling with immigrants and new Americans from across the globe -- literally everywhere -- from Pakistan to Ireland, from Ecuador to China. It has been a corridor of immigration for almost a hundred years since the subway opened in 1913. The nationalities represented may have changed (and expanded), but a ride on the 7 train is a great journey into the American experience of immigration, past, and present. This is why the #7 was honored by the White House as a National Millennium Trail, right up there with the Appalachian Trail and the Iditarod. So, why visit? The international food is the number one reason by far. The art and jazz museums and the area's history are all worth it, too. Start your journey on the 7 in Grand Central Station. What follows are the neighborhood highlights as the train rolls through western Queens. Choose a couple areas to visit that sound interesting and plan to spend a few hours. First stop Long Island City is an industrial area rapidly going condo, turning into an eastern extension of Midtown. Exit the train and walk back a couple long blocks toward Manhattan. Yes, that's the United Nations directly across the East River. At the end of the block, stretching out on docks over the East River is Gantry Plaza State Park (48th Ave at Center Blvd), named after the hulking 19th-century railroad gantries that transferred cargo from ships to trains. It's a premium postcard view of the city and a must for Fourth of July fireworks. Backtrack to Vernon and go up Jackson Avenue a few blocks to PS 1 Contemporary Art Center, a museum devoted to contemporary art. Housed in a former public school -- from back when they built schools to look great -- PS 1 is an outpost of MoMA but manages to keep an edge about it. It's a real kick to explore the corridors and especially its basement, and every summer the DJ-driven Warm Up parties in PS 1's courtyard are a hit. Across the street, you'll find another type of artwork: the legal graffiti site 5 Pointz (Crane St. and Jackson Ave.). Inside the former warehouse are art studios, and outside it's a spray paint gallery (by permission only). Hop back aboard the 7 subway at 21st Street and 49th Avenue, and head east (toward Flushing). You'll get a nice view of the Queensboro Bridge (aka 59th Street Bridge). Completed in 1909, its elegant spans are a famous sign of New York and the subject of Simon and Garfunkel's serenade "The 59th Street Bridge Song (Feelin' Groovy)." 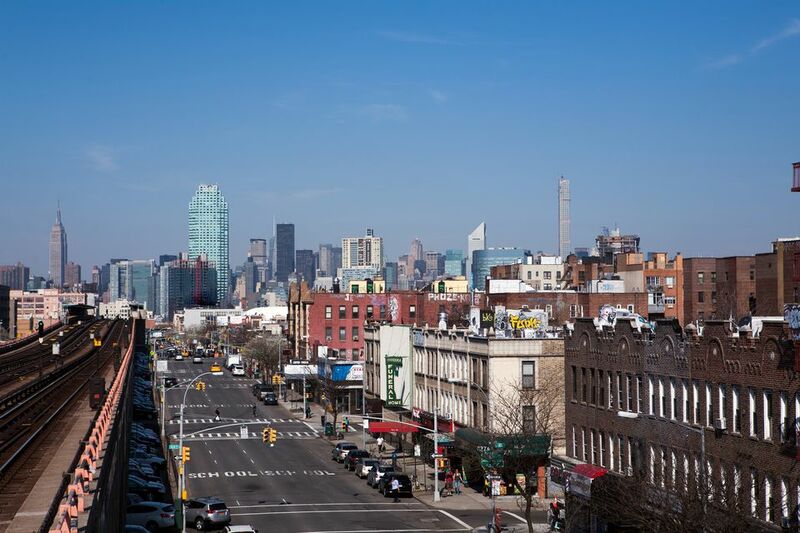 Sunnyside is a delicious, little neighborhood, split by the elevated 7 subway and busy Queens Boulevard. It's a calm oasis on the 7 line, a neighborhood with a little breathing room, but plenty of character. The strip along the northern edge of Queens Boulevard is a fun peak into middle-class diversity in Queens. Within a few blocks, you can sample spicy Korean BBQ (Shin Chon Kalbi), novel Indo-Chinese (Tangra Masala), satisfying Turkish (Hemsin), kitschy Roumanian (Casa Romana), and good, ole Italian (Dazie's). You might also peek at a great Irish butcher and an award-winning cake decorator. If you're not ready to eat, try a pint at the Gaslight, a fine Irish pub with outdoor seating. Or warm up with some java at Armenian coffee store Baruir where the coffee beans are roasted in the store. Where else but Woodside can you find the best Thai food in NYC a few blocks from one of the city's best burgers? Working-class Woodside is a polyglot neighborhood with a serious thing for Irish pubs and ethnic eats. Sripraphai Thai Restaurant doesn't look like much on the outside, but the inside was totally renovated a couple years ago and the backyard garden is a delight. It's a big destination for "chowhounds" that lives up to the hype and the warnings about the chile heat. Woodside is also home to a slew of Irish pubs, and a string of Filipino restaurants and shops that form a Little Manila. Donovan's has won the praise of food critics year after year for its humble, but delicious burger. Head back to the #7 for a short ride to 74th Street-Broadway and Jackson Heights, another diverse neighborhood, famous for its Little India, for its 1920s garden co-ops, and as the setting for the Oscar-nominated Colombian film Maria Full of Grace. Walk up 74th Street, the heart of Little India. It gleams with the distinctive patina of the 22k gold in its many jewelry stores. In between, you’ll find shops selling saris, Bollywood DVDs, and South Asian imports, and sweet shops and restaurants offering chicken tandoori, vegetarian curries, and lamb kebabs. Are you a real architecture buff? Obsessed with the history of cities? Then keep walking north and you'll soon be in the Jackson Heights Historic District, 30 blocks of landmarked co-op attached houses and apartment buildings with beautifully maintained park-like courtyards. Built for the middle class in the roaring '20s, the prewar co-ops are being rediscovered by a new generation of New Yorkers. Two of the best examples -- The Chateau and The Towers -- are on 80th and 81st Streets, between 35th Avenue and Northern Boulevard. The Chateau's slate mansard roofs give it an Alpine look, and the interior gardens of The Towers are exceptional. Peak in through the courtyard gates, and maybe you'll be lucky enough to get invited inside. Jackson Heights and the adjoining neighborhoods of Corona and Elmhurst are the homes of waves of Latin American immigrants, particularly from Colombia and more recently, Mexico. Walk along Roosevelt Avenue, under the elevated subway, from 82nd St to 90th St, and you'll be treated to earfuls of ranchera and cumbia pulsing from shops and restaurants. Stop into taco stands for snacks and try real Mexican cowboy boots at leather stores. Corona is a little more humble than Jackson Heights but counts two worthy stops for attention. At the next stop, you'll find the biggest, most popular destination in Queens: Flushing Meadows-Corona Park. Site of the 1939 and 1964 World's Fairs, Flushing Meadows is also the home of the US Open and the New York Mets baseball team. And it might surprise a lot of New Yorkers to hear that it's larger than Central Park, with about 50% more territory. Though the park has tons to do -- there's a zoo, a science museum, a marina, two lakes, an ice skating rink, lots of soccer pitches, and a couple cricket fields -- there's a lot of ground to cover, and you won't want to walk too far from the Mets-Willets Point stop. If you're a baseball fan, exit the train north for Citifield. Or, exit south to visit the Billy Jean King Tennis Center for the US Open or even to volley with a pal. The grounds -- though not Arthur Ashe Stadium -- are open throughout the year. Continue on the footpath past the Open, and you're soon at the most familiar Queens landmark: the Unisphere, a 140-foot-high steel globe, and site of the final battle scene in the movie Men in Black. Built for the 1964 World's Fair, it's a masterwork of engineering -- and a cool spot for photographers and skateboarders. Next to the Unisphere is the Queens Museum of Art, onetime home to the United Nations. Its biggest draw is the amazing Panorama of the City of New York, a diorama of all five boroughs, filling a large room with its 9,335-square-foot, 895,000-building scale model (1 inch equals 100 feet). Your final stop on the #7 is at Main Street in Flushing, and though you're at the end of the line, this downtown bustles as hard as Manhattan. Flushing is the largest Chinatown in New York City, with a significant Korean population, too. In between the Asian language signs, you can see a couple small signs of the colonial past in the birthplace of religious freedom in America. Flushing was once an important Dutch colonial town, founded as Vlissingen in the 1600s and part of the New Netherlands. It was settled by English families and the pacifist Quakers. When Governor Peter Stuyvesant forbade Quaker meetings, Flushing residents protested, making perhaps the earliest demand for religious freedom in the Americas in a document known as the Flushing Remonstrance. Stuyvesant was later reprimanded by the Dutch West Indies Company, his edict repealed and religious liberty established throughout the colony in 1663. Come out of the subway in the thick of things on Main Street, a hub of commerce and Taiwanese bubble-tea cafes. Walk north on Main Street toward that church steeple. It once dominated the area, but St. George's Church (135-32 38th Ave, 718-359-1171) now recedes a bit in competition with the new shops and restaurants, teeming with signs in Chinese, Korean, and English. The Episcopalian church -- a later rendition of the original, which was chartered by King George III - is a calm oasis. Continue up to Northern Boulevard and turn right to see the plain wooden Friends Meeting House (137-16 Northern Blvd, 718 358 9636), built in 1694. Across the street is Flushing Town Hall, a Romanesque Revival building, now home to the local arts council and its monthly Queens Jazz Trail tour. Before heading away on the subway, you have to eat. Try one of the delicious and relatively inexpensive Chinese, Thai, and Malaysian restaurants on Prince Street.